Bovada, largest US friendly poker site has discontinued their poker site as of September 30, 2016. Their online poker site has merged into Ignition Casino, which will soon be reviewed by iMacPoker.net. For the time being we advise you to have a look at our Americas Cardroom Poker review. 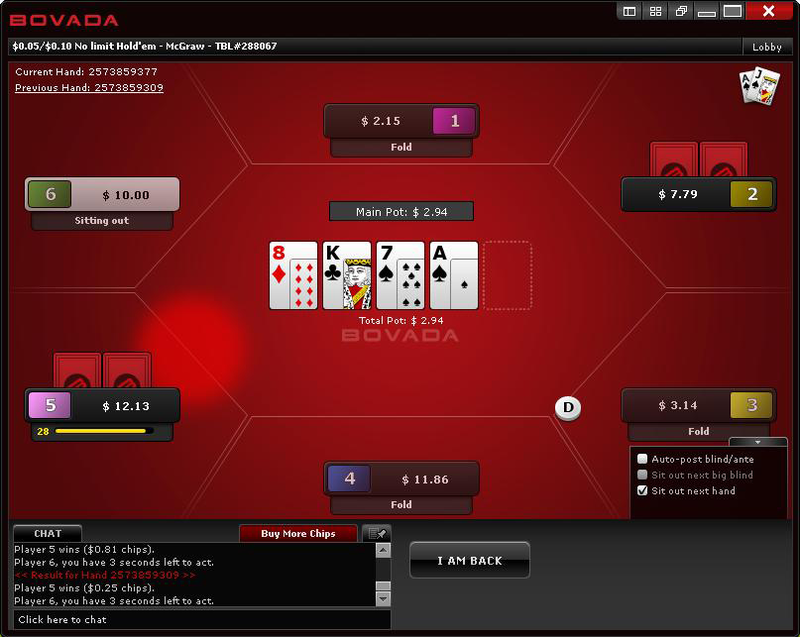 Although Bovada Poker was technically launched in 2011, the site did not offer up a completely new online poker experience for players. This is down to the fact that the site has replaced Bodog but it has maintained its US friendly nature. The Bodog name is still around, available to players in the rest of the world but for US players, Bovada Poker is the place where they can enjoy online poker. The site also allows players to enjoy sports betting, horse racing and casino opportunities. The fact that the site remains on the previous network means that players from all around the world can take part against each other. While Bovada Poker has a new spirit and energy arising from the change, it still provides the consistency and quality of a site that has been around for years so in many ways, poker players have got the best of both worlds from Bovada Poker. If you have been looking around for a reliable online poker site that is friendly to Mac users, you will be delighted to know that Bovada Poker fits the bill. The site provides Mac download options which mean that Mac users will be able to gain access to all of the standard features and tournament options that are open to PC users. Anyone looking for a more involved online poker experience would be advised to check this site out. While many sites claim to be Mac friendly, there are different levels of friendliness! Thankfully Bovada Poker is a full-on poker site for Mac users which means that there are plenty of opportunities to get involved with on site. All of the gameplay, tournaments, bonuses and every element of engagement and interaction that can be found on the PC version of the Bovada site can also be found on the Mac version. If you are a Mac poker player looking for a site to use with confidence, Bovada is the site for you. Any new player signing up for the poker action at Bovada Poker will have the chance to pick up a 100% matched deposit bonus. This is a great welcome to any poker site and will provide players with the opportunity to boost their bankroll before they begin. The maximum bonus available with this promotion is $1,000 and players will have 60 days to fully redeem their bonus. The bonus is issued in stages based upon the amount of Poker Points that a player earns through their real money poker play. At level 1, a player earning 50 PPs will earn the first $10 of their bonus. The next level sees a player requiring to reach 250 PPs where they will receive a total of $40, taking their overall bonus payment to $50. The third level is based upon reaching 750 points and a player will receive $100 for doing so, taking their bonus to $150. The following level is based upon reaching 1,500 PPs where there will be a further $150 available in bonuses, taking the full bonus amount to $300. The fifth level sees players aiming to reach 3,000 PPs and when they do, they will receive a further $300 on bonuses, taking their total bonus up to $600. The final bonus level requires players to reach 5,000 PPs where they will receive $400, taking their full bonus up to the maximum level of $1,000. Of course, if a player is to receive a lesser bonus amount, they will receive full payout when they hit the required pay-out point for the bonus that is due to them. New poker players on site will also be provided with six qualifiers to the big Sunday $100,000 guaranteed tournament. Bovada Poker also provides a refer a friend bonus where you can receive a 100% bonus up to a level of $100 for referring a friend to the site. The size of your bonus will depend on the level of initial deposit that your friend makes on site. Another bonus element that Bovada Poker provides can be found with satellite events to major poker tournaments around the world. At the time of review, the major promotion was based upon poker players gaining entry to the Anonymous Poker Series South Asia event. The overall prize package amounts to over $6,600 so there is a lot to play for on the site on a regular basis. Anyone that has any experience with US friendly poker sites will know that there is often a limited array of deposit methods to choose from. In comparison to the number of deposit methods that are provided by European-centric poker sites, this is certainly the case but on the whole, the range of deposit methods provided by Bovada Poker is not that bad. Players have the opportunity to deposit funds into their account via Visa, MasterCard, Neteller, Skrill, wire transfer and check facilities. This should provide enough variety to keep the majority of online poker players happy and playing online. The Big Deal for poker players on Bovada Poker comes along every Sunday with the guaranteed $100,000 tournament taking place at 4pm EST. There are qualifiers for this event taking place throughout the week but it is also possible to buy into it directly. There is a whole host of events on a Sunday at Bovada Poker, leading the site to dub it Super Sunday. In total, there is more than $250,000 in guaranteed prize pools on a Sunday with Bovada Poker. There are also two $7,500 freerolls taking place every month on site so there is an opportunity to play for $15,000 without spending any of your own money. If you don’t yet have the bankroll that matches your ambitions, freeroll poker events are the ideal way to play online poker. Other regular tournaments on site include the 10 o’clock Turbo, the Nightly $10K, the Wild West Shootout for $6K, the little Rebuy and the Big Rebuy. No matter what day of the week you log on to Bovada Poker, there is sure to be a great range of poker tournaments to choose from. 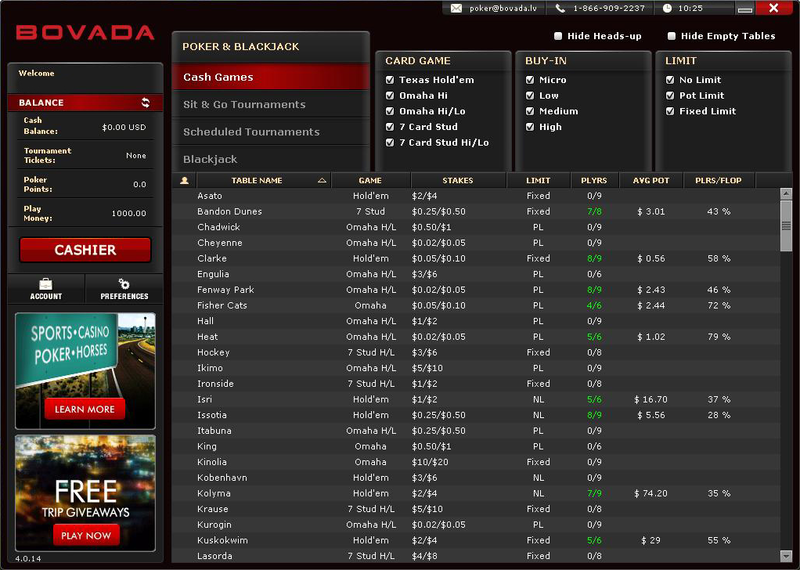 Bovada Poker provides a convenient and reliable place to play poker, even for US players and Mac users. With a great range of poker tournaments and a strong selection of welcome bonuses, Bovada Poker is a natural choice for so many online poker players.